Kathy Zahedi, DDS & Associates offer veneers and other cosmetic procedures that can correct a wide range of flaws in your smile. The practice, located in Santa Monica, California, utilizes state-of-the-art technology in a comfortable, patient-friendly environment. 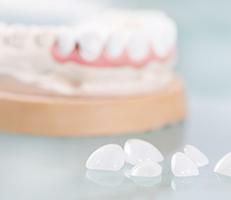 Veneers are decorative coverings applied directly to the outside surface of a tooth to hide imperfections, such as chips, cracks, stains and discoloration of the enamel, and gaps between teeth. Veneers can also be used to correct the appearance of misshapen or uneven teeth. What material are used to make veneers? Dr. Zahedi offers porcelain dental veneers. Depending on the specific indication, various types of porcelain may be used. Porcelain has several distinct advantages over some other dental materials. It’s biofriendly to your gums and teeth; plus, the material is stain-resistant, strong, and natural-looking. First, Dr. Zahedi makes an impression of your mouth, which is sent to a dental lab where your temporary is custom-created to fit your mouth and teeth and facial symmetry. This may take a couple of weeks. At that point, Dr. Zahedi prepares your teeth to install the temporary's. It is very important that the shape of the teeth have harmony with the shape of the face. Dr. Zahedi contours the temporary in the month until this harmony is acheived. Once Dr. Zahedi and the patient are happy with the temporarys, we direct the lab to fabricate the porcelain veeners. 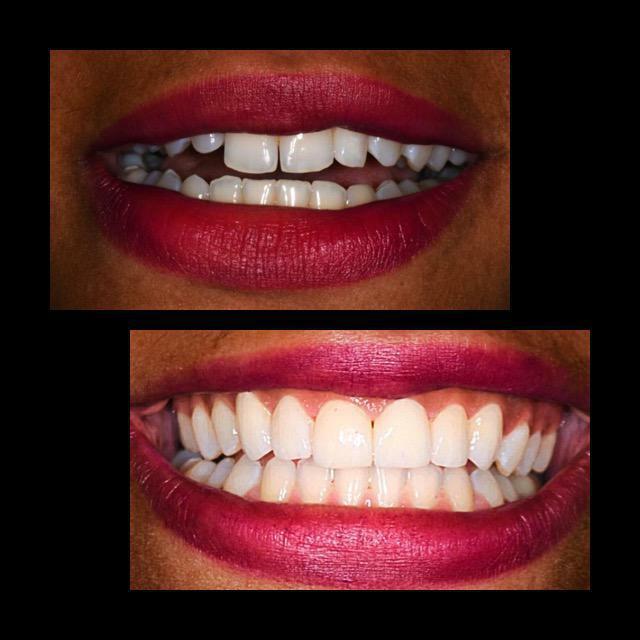 The final veneers are always tried in to make sure the patient is 100% satisfied with the shape and color before we cement them permanenetly. A porcelain veneer can last up to 20 years, provided you practice proper dental hygiene. That means, brushing twice a day, flossing at least once per day and having your teeth professional cleaned and examined twice a year. Also, as with your natural teeth, it's important to avoid biting hard foods, such as ice cubes or popcorn kernels. These can cause both your teeth and/or veneers to crack or chip. Also, your gum tissue and teeth are living and therefore may change over time. If this occurs, it may affect the fit of your veneer, necessitating an alteration. My experience with Dr. Zahedi was nothing short of amazing. She is such a professional and extremely knowledgeable within her profession. I expressed to Dr. Z that I’ve always wanted to have that “Colgate” smile. Being the sweet person she is, first and foremost she assured me that my smile was very beautiful just the way it was. Yet and still she was more than willing to help me achieve my goal. I will admit I was very afraid. What will the veneers look like? What will my temporaries look like? From what I’ve heard from collegues and friends, temporaries can be a bit firghtnening because they dont look exactly like the permanents. When Dr. Z put my temporaries in I was beyond pleased! They looked absolutely amazing! The thought that my actual veneers would look even more phenomenal was baffling to me! During the procedure she was extremely gentle, efficient, warm and she checked in on me constantly. I can honestly say that I never experienced any pain. Dr. Z was such a joy. She is so kind and so beautiful. Lets be honest, having a beautiful dentist makes the experience that much more enjoyable, especially beause you are staring at them for a few hours! Lol! Once my temporaries were successfully in place, Dr. Z made it a huge point of hers to check in on me. She would send a text ocassionally to make sure that everything was ok. If I ever had any concerns she was always available. How cool is that? I look at my teeth everyday and I feel like a new woman! I am far more confident than I’ve ever been! I can’t stop smiling and that is a beautiful thing! If you are looking for a wonderful dentist, who is very professional, highly skilled within their craft, absolutely beautiful, very friendly and extremely caring…. Dr. Z is your girl! Please pay her a visit and have the dental experience you never knew you could! I promise, you will not regret it! I am just in awe of her artistry! I LOVE my new smile! At Kathy Zahedi, DDS & Associates, we accept most major insurance plans. Here is a list of some of the plans we accept. Please contact our office if you do not see your insurance provider listed. "I recently needed a crown on a molar tooth. My friend told me that Dr. Zahedi was good. So I gave her a try. She did a masterful job and managed every step." "My kids and I have been seeing Dr. Zahedi for 5-6 years. She's great. She's kind and attentive. She also explains what she’s going to do before she does it." "This is the best dental experience I have ever had. I recommend this office to anyone. Very friendly and professional." "I had a fear of going to dentists until I came to Dr. Zahedi's office. Everyone here is so professional and kind, that my fear has completely gone away." "Dr. Zahedi and her team are Angels! I actually look forward to going to the dentist now. They are professional, personable, and gentle!" "You are the absolute best, most professional and amazing person I know. Thank you for being you"
"You are such a beautiful soul. You radiate kindness and generosity! I'm so excited to have an amazing dentist I can call home!" "You not only gave me my clean white smile back, you also reminded me how important it is to take care our body, our temple!!! Thank you for all you do"
"The great thing about Dr. Zahedi is her attention to detail. The color, placement, and shape are perfect. My new tooth is more flattering than my own tooth was." "Never in my life did I think that I would be enthusiastically leaving a Yelp review for my Dentist." "I give her my highest recommendation. Her whole team is knowledgable, friendly and they really take care of you." "The most soothing, relaxing experience I've ever had at the dentist...Dr. Zahedi is so gentle and reassuring...Highly recommend!"